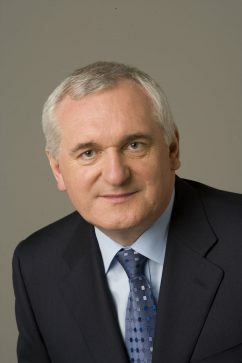 Bertie Ahern is the former Taoiseach (Prime Minister) of Ireland, a position to which he was elected following numerous Ministerial appointments as well as that of Deputy Prime Minister. A defining moment of Mr Ahern’s three terms in office as Taoiseach was the successful negotiation of the Good Friday Agreement in April 1998. Mr Ahern held the Presidency of the European Council in 2004, presiding over the historic enlargement of the EU to 27 member states. Since leaving Government in 2008 Mr Ahern has dedicated his time to conflict resolution and is actively involved with many groups around the world. Current roles include Co-Chair of The Inter Action Council; Member of the Clinton Global Initiative; Member of the International Group dealing with the conflict in the Basque Country; Honorary Adjunct Professor of Mediation and Conflict Intervention in NUI Maynooth; Member of the Kennedy Institute of NUI Maynooth; Member of the Institute for Cultural Diplomacy, Berlin; Member of the Varkey Gems Foundation Advisory Board; Member of Crisis Management Initiative; Member of the World Economic Forum Agenda Council on Negotiation and Conflict Resolution; Member of the IMAN Foundation; Advisor to the Legislative Leadership Institute Academy of Foreign Affairs; Senior Advisor to the International Advisory Council to the Harvard International Negotiation Programme; and Director of Co-operation Ireland.